Four voices SATB plus baritone solo. No. G951. Five or more voices and one instrumentalist on kylakaphone, or six voices alone. No. G861. Mobile pickup orchestra or chamber band and a billion entertaining percussionists. No. G891. Alto, string bass and piano. No. G921. Two alto voices. No. G931. SAB chorus and harmonicas (or occasional organ or keyboard). No. G781. Chorus SATB, maybe with cello obbligato. No. G957. Four bass'uns to open bass fishing seasons. No. G954. Violin and clarinet. No. G952. Tenor and small apolitical band. No. G893. Violinne, Bb clar, basclar, cjello, percus. No. G958. Brass quintet on an early American tune. No. G941. Incidental Music to Something Wicked This Way Comes. Calliope and chamber band. No. G945. Energetic and talented chorus SATB, with drum machine. No. G922. Clarinet and marimba. No. G942. Brass quintet and saw. No. G755. Clarinet, violin and electronic keyboard. No. G943. Two alto voices. No. G953. Clarinet, violin, marimba, electronic keyboard. No. G944. Clarinet and calliope. No. G946. Three movements for violin, clarinet, cello, piano and voice. No. G923. Two alto voices. No. G947. Two alto voices. No. G948. Tenor, chorus, piano, guitars, percussion and guest instruments, on the Morley text. No. G762. Chorus, two narrators, flute, recorder, piano, rhythmatron, mousetraps, two jugglers, cheese balls, etc. No. G821. SATB -- or really BATS -- recorders. No. G751. A cabaret for game show host Bob, Nurse Rebecca, Sergeant Gus, and victim Jules, two keyboards, percussion, cello, etc. No. G871. Two voices, water glasses, two synthesizers, and taped percussion. No. G763. Four dysfunctional voices with melodic instruments of their choice. No. G771. Overdubbed electronic keyboard on tape. No. G892. Two krumhorns, trombone and percussion. No. G791. Part Two, three odd instruments; Part Three, three odd voices. No. G784. Two synethsizers, two recorders, and harmolin on tape. No. G752. Performance work for 16 ambient persons in living room tableau with props and furniture. No. G761. Small upaid group of instrumentalists. No. G701. Two oboes and English horn. No. G702. Two recorders of any speed. No. G753. Seated euophoist with two-dancer accompaniment. No. G703. Triangulum, autoharp, and monofilament. No. G812. Four approximately pitched voices, preferably those of criminals. No. G813. Performance work for vocal soloist and four or more mourners in a graveyard. No. G801. Five celebretory voices in active canonical whoopification. No. G811. Two recorders meeting for the first time. No. G758. Four overdubbed voices on tape. No. G955. Organette, bass drum and humming chorus. No. G759. Four overdubbed recorders on electronic tape. No. G741. Overture for orchestra. No. G704. Three anonymous Witness Protection Program instruments. No. G7510. Performance work for tolerant waitress and four raucous customers (with percussion) at four in the morning. No. G754. Soprano, tenor, two keyboards, mousetraps. No. G894. Dance improv accompaniment for prepard piano, synthesizer and percussion. No. G782. Soprano, cruel pianist and twirling chorus of six. No. G792. SATB annoying approximately-pitched solo vocal quartet with attitudes. No. G802. Two recorders of any flavor. No. G756. Three recorders STB or available woodwinds. No. G851. Dance improv accompaniment for synthesizer, recorders, etc. No. G742. Libretto to the chamber opera. No. W771. Clarinet and piano. No. G803. Tenor, keyboard synthesizer, cello. No. G911. Performance work for three automatonical voices. No. G764. Mixed quartet, coffee percolator, and server. No. G705. "Bells-a-bub", a Bathory percussion tree. No. G7512. Solo chorus SACtB and melody instrument of any flavor. No. G706. French horn, piano, string bass, brass quartet, easily-distracted page turned. No. G707. Tenor and chamber band, or voices and electric bass and/or keyboard. No. G891. Stomach rumbling for 4 to 8 hungry stomblers, medical assistants and props in a medical clinic tableau. No. G765. Piano, child, cream pie, tear gas, deceased bird. No. G708. Two sopranos, two recorders and two krumhorns who double on other odd instruments. No. G783. Babysitter, 8 unhappy toddlers, 8 pacifiers. No. G757. narrator, witch, piano and instrumental octet. No. G691. Speaker, two chanting voices, synthesizer, guitar and drum machine. No. G912. Small group of argumentative instruments and voices. No. G709. Overdubbed eccentrically modal xylophones on tape. No. G895. 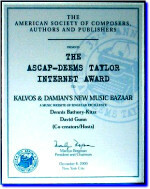 David Gunn and his music are represented by ASCAP.